Professor Samuel G. Armistead offers us one more book in his series of Folk Literature of the Sephardic Jews, the third focusing specifically on Judeo-Spanish Ballads from Oral Tradition. Following the previous volumes, which were dedicated to Carolingian Ballads on the themes of Roncesvalles (1994) and Gaiferos (2006), the theme studied and analyzed in the present volume is that of Conde Claros, edited and studied by Samuel Armistead with musical transcriptions and musical studies by Israel J. Katz. As their former publications, this book includes two sections of ballad analyses, a rich and comprehensive bibliography, indices and a glossary. As the former volumes, the present one is based on materials collected in fieldwork conducted by Armistead, Silverman, and Katz in Tétouan, Morocco (1962, 1963), and one version collected by Katz in Israel (1971). To these materials, Armistead adds to his study versions from the rich corpus of Sephardic romances that he had catalogued at the Menéndez Pidal Archives in his three-volume work El romancero judeo-español en el Archivo Menéndez Pidal (Catálogo –índice de romances y canciones) (Madrid, C.S.M.P., 1977). Armistead’s aim is, in his own words, “to study each ballad as an oral poem, a work of oral literature, elaborated over centuries of collective authorship by the uncountable individuals who make up the author legion” (by this term he means “all singers of a given ballad, in all its multiple variations, in whatever geographic subtraditions it may be sung”). He certainly fulfills this goal, presenting each of his collected ballads in direct comparison with a wide repertoire of romances in Hispanic written sources of the 16th century, with Sephardic versions collected in the 19th and 20th century, and with romances collected from the oral tradition in Spain. According to Armistead, the hero of the ballads, Conde Claros de Montalbán, could have some connection to the French hero Renaud de Montauban, but, despite several allusions to France in the ballad’s text, Armistead recognizes that “it has no epic antecedents and must be characterized as Pseudo Carolingian.” In the Sephardic tradition the romance of Conde Claros, “a particularly complex example of the creative uses of contamination,” has survived combined with other themes: Conde Claros y el Emperador (Count Claros and the Emperor), Conde Claros insomne (Sleepless Count), La jactancia del conde Velez (The Vainglory of Count Velez), Conde Claros y la infanta (Count Claros and the Princess), Conde Claros fraile (Count Claros in Friar’s Garb), and El nacimiento de Bernardo del Carpio (The Birth of Bernardo del Carpio). Armistead dedicates a first part (Theme 10, pp.1-124) to a literary study originating in two versions that combine the first two mentioned themes (Conde Claros y el Emperador + Conde Claros insomne): the first one, a version from an informant from Salonika collected in 1971 by Katz in Kiryat Matalon, Israel; and the second one a version from Tétouan, Morocco collected in situ by Armistead and Katz in 1962. These two versions show the presence of this theme in both the Eastern and the Moroccan Sephardi communities. Since both versions were not sung but recited, Katz provides only rhythmic transcriptions, in both cases in binary meter. To these two versions Armistead adds eighteen versions for comparison, of which eleven belong to the Menéndez Pidal Archive and the others to other collections such as Attias’ and Crews’. To show the permanence of the theme in the oral tradition, let me mention that the Salonikan version of this ballad that I collected in Tel Aviv in 1993, although fragmentary, coincides in its plot with the synthetic version that Armistead proposed for the Eastern tradition (14-15) and opens with the same incipit. In the second part (Theme 11, pp.125-461) Armistead studies the combination of the themes Conde Claros y la infanta, Conde Claros fraile, and El nacimiento de Bernardo del Carpio. The eight versions of the romance presented are all from Morocco, collected in 1962: the first five versions—from the same (almost mythological) informant (partly sung and mostly recited)—were collected in Tétouan by Armistead and Katz. The other three versions are from various informants from Larache, Morocco: two collected by Armistead, Katz, and Silverman; and the last collected by Samuel Fereres, whose collection the authors acquired in 1962. As in the first part, Armistead provides a synoptic version of this complex romance, followed by a comparative study of textual motifs with twenty-two other versions from the various Sephardic communities of Northern Morocco (eight from Tangier, nine from Tétouan, three from Larache and two from Alcazarquivir). Most of these versions (thirteen) are from the Menéndez Pidal Archive; the others come from known collections such as that of Larrea Palacín. In both parts Armistead analyzes the motifs as they appear in each presented version, and then compares the narrative segments of these versions with those in written sources of the 16th century. He also conducts a thorough comparative study of the ballads outside the Hispanic traditions, including Scottish, German and Hungarian ballads, and ballads from the oral tradition in the Spanish regions: Leon, Cantabria, Cataluña, Asturias and Galicia. To Armistead’s thorough and always inspiring analysis of the texts, Katz adds his detailed study of the ballads’ tunes. Aware of the difficulty in tracing Hispanic musical sources of the romances’ tunes—in his words, “none of the tunes associated with these romances can be traced to early Iberian sources”—Katz comments on two old musical sources related to Conde Claros. One of these sources is the tune used by Juan de la Encina (1468-1521) in his vocal setting of “Pésame de vos el conde” for solo voice and instruments. Katz mentions the diferencias (variants) based on the romance Conde Claros by Luys de Narváez, in Los seys libros del Delfín de música, printed by Diego Hernández de Córdoba in 1538 as well as the use of Conde Claros by other vihuelistas: Alonso Mudarra (1546), Enríquez de Valderrábano (1547), Diego Pisador (1552), and Venegas de Henestrosa (1557). The second source described by Katz is Francisco Salinas’ quotation of romance tunes as didactic examples in books VI and VII of his monumental work, De Musica Libri Septem (Salamanca 1577). Salinas quotes short fragments of romances, songs and other genres that were popular at his time to illustrate various issues of rhythmic performance. Yet Katz expresses doubts about the reliability of Salinas’ notation (312), showing no less than twelve different ways to transcribe Salinas’ quotation of the first two hemistiches of Conde Claros—including attempts made by Pedrell (1900:392), Gonzalo Menéndez Pidal (1953:I, 387), Pope (1953:396) and Querol (1954:322). In his musicological commentary (293-379) Katz also presents comparative examples from the musical transcriptions of Sephardic romances made in 1915-1916 by Manrique de Lara (catalogued at the Menéndez Pidal Archives), as well as those by made by Arcadio de Larrea Palacín in 1952. From the ballad tunes in the Spanish oral tradition he presents additional examples from the collections transcribed by Manzano, Schindler, and others. He even quotes musical transcriptions from more recent publications like that by José Manuel Fraile Gil on the oral tradition of Province of Madrid, with its musical transcriptions by Eliseo Parra García, and the collection of Jesus Suárez López (1987-1994) from Asturias, transcribed by Susana Asensio Llamas. To conclude: this is a highly recommended publication, a book that is both exemplary in its scholarship and useful to all those interested in themes of both the Sephardic and the Hispanic Romancero. Moshe Attias, Romancero sefaradí: Romanzas y cantes populares en judeo-español, 2nd.ed. (Jerusalem: Ben-Zvi Insitute, 1961); Cynthia M. Crews, “Textos judeo-españoles de Salónica y Sarajevo con comentarios lingüísticos y glosario,” ed. Iacob M.Hassan, Estudios sefardíes, 2, (1979), 91-258. Susana Weich-Shahak, Romancero sefardí de Oriente. Antología de tradición oral (Madrid: Editorial Alpuerto, 1910), pp.68-69, No.3, recited by Renée Bivas-Sevy, from Salónika, recorded in Tel Aviv, 7.11.1993. Arcadio de Larrea Palacín, Romances de Tetuán, 2 vols. (Madrid: C.S.I.C., 1952). Cancionero Musical de Palacio, in Francisco Asenjo Barbieri, Cancionero musical de los siglos XV y XVI (Madrid, Tipografía de los Huérfanos, 1890; 2nd. Ed., Málaga: Gráficas Urania, 1987, no.329). Francisco Salinas, Siete libros sobre la música, trans. Ismael Fernández de la Cuesta (Madrid: Alpuerto, 1983). Felipe Pedrell, “Folk-lore musical castillan du XVIe siecle,” Sammelbande der Internationalen Musik-Gesellschaft (Leipzig, 1900, 372-400); Gonzalo Menéndez Pidal, “Ilustraciones musicales,” in Ramón Menéndez Pidal, Romancero hispánico (hispano-portugués, americano y sefardí), 2 vols. (Madrid: Espasa-Calpe, 1953, vol I, pp. 367-402); Isabel Pope, “Notas sobre la melodía del Conde Claros,” Nueva Revista de Filología Hispánica, 7, (1953), 395-402; Miguel Querol, “Importance historique et nationale du romance,” Colloques Internacionaux du Centre National de la Recherche Scientifique, V: Musique et poesie au XVIe siecle, ed. J. Jacqot (Paris: CNRS, 1954, pp. 299-327). 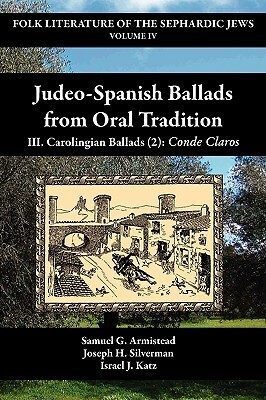 For other instances comparing Sephardic ballads with old Spanish musical sources in which romance tunes were used by Spanish vihuelistas as a basis (tenor or cantus firmus) for their instrumental compositions, as well as by court composers for vocal settings or for voice and instruments, see Judith Etzion and Susana Weich-Shahak, “The Spanish and the Sephardic Romances: Musical Links,” Ethnomusicology, vol. 32, no.2, (Spring/Summer 1988), 1-38. Miguel Manzano and Angel Barja, Cancionero Leonés, vol.II, tomo I: Cantos narrativos (León: Diputación Provincial, 1991); Kurt Schindler, Música y poesía popular de España y Portugal, 2nd ed., ed. Israel J. Katz and Miguel Manzano Alonso, with the collaboration of Samuel G. Armistead (Salamanca: Diputación de Salamanca, 1991). José Manuel Fraile Gil, Romancero tradicional de la Provincia de Madrid, musical transcriptions by Eliseo Parra García, (Madrid: Comunidad de Madrid, 1991); Jesús Suárez López, Nueva colección de romances (1987-1994), with Mariola Carvajal Alvarez, musical transcriptions by Susana Asensio Llamas (Oviedo-Madrid: Fundación Menéndez Pidal, 1997). The erudite labors of Armistead, Silver and Katz are not only superb performances of refined scholarship but monuments of poetry and music caught at their last seconds of existence in the folk culture before either physical annihilation or cultural assimilation. Their names and scholarly accomplishment should be honored for their accomplishment and nobility of purpose. They have saved a one thousand year old tradition, itself a wonderment of survival for so long in such tragic conditions. Their work presents the most beautiful example of selfless service to mankind: preserving a human culture and its artifacts. Thank you for your wonderful comment. Though Prof. Armistead doesn’t read material online himself, I will be sure to print this out for him. He will appreciate knowing your thoughts.